The Gray Birch - Betula populifolia Marshall, is most easily distinguished by it's triangular leaf with flattened base, elongated tip and doubly toothed margins. It is a deciduous tree that reached heights of about 40 feet. Generally growing in a multi trunk, curving or leaning fashion it makes for a beautiful focal point in both residential and commercial landscape settings. The Silverbell - Halesia is a very small genus of five species of large deciduous shrubs or small trees in the family Styracaceae. It is most commonly found and reaches its greatest size in the Southern Appalachian Mountains where it is called The Mountain Silverbell. Species of this genus include Mountain-monticola (Snowdrop), Carolina -carolina (Little), Common- tetraptera, Two Winged- diptera, and Chinese-macgregorii (MacGregor's) Silverbell. This genus is only native to Eastern Asia and Eastern North America, and can be grown in hardiness zones 4-8. The different species within this genus are sometimes disputed as all being very similar to one another, some researchers say the genus only includes three members while others say four or five. This attractive shrub or small tree grows in moist soils, commonly along streams and in the understory of hardwood forests. It has a moderate growth rate and can lives about 100 years. In tree form it can reach anywhere from 15-65 feet tall. The leaves are simple and ovate in shape and a medium green during the growing season. The wood is soft and close grained. The white bell shaped pendulous flowers and small size make it a desirable tree for landscaping. The flowers are a white or very pale pink, produced in open clusters of 2-6 flowers. The fruit is a distinctive, oblong dry drupe that is 2–4 cm long. All species except for the Two-Winged (Halesia diptera) have four narrow longitudinal ribs or wings on fruit; diptera only has two, making it the most distinctive of the group.The seeds are eaten by squirrels and the flowers provide honey for bees. 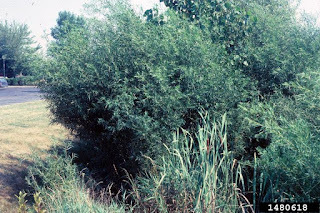 The Sandbar Willow - Salix interior, is most easily identified by it's shrubby, thicket forming growing habit and narrowly linear leaves that are bluish white below. Sandbar Willow grows as a small tree or large shrub reaching heights of 13-30 feet tall, usually growing in a rounded, dense, shrubby, sprawling fashion with multiple clonal trunks arising from wide spreading surface roots. Rarely does the Sandbar Willow grow with a single erect trunk. The leaves are alternate, simple, narrowly linear, with a wedge shaped base. The upper leaf surface is moderately lustrous and hairy, with a paler lower surface. The flowers are unisexual, male and female flowers intermixed on the same catkins. The flowers occur in Spring to Summer, after the new leaves appear. The fruit is a capsule 4-10 mm long. 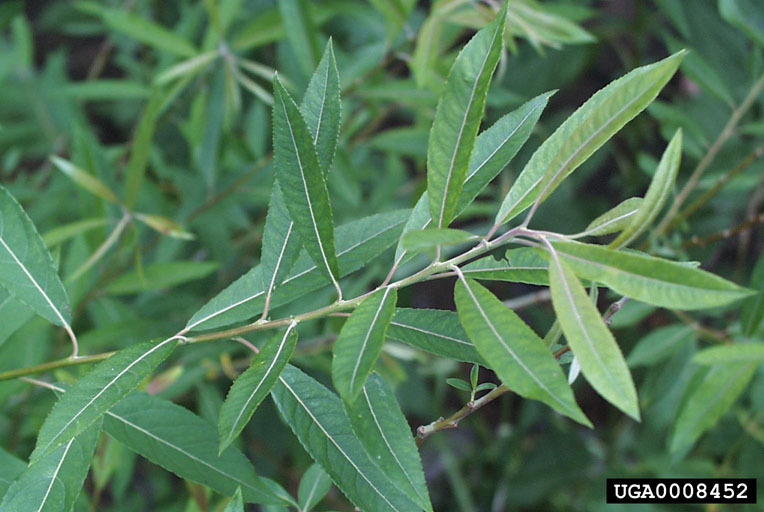 The Sandbar Willow is native with specimens being found growing from 10-1800 m in a triangle shape across the North America. It can be found as far North as Alaska, British Columbia, Quebec and New Brunswick, Maine to Virginia in the East, Louisiana to Texas in the South and Colorado, Washington and back to Alaska in the West. It is most commonly found along sandbars, sandy or silty floodplains, lake or pond margins, drainage ditches, distrubed sites and sand hills in the Praries. The Tangerine - Citrus reticulata is also referred to as the Satsuma or Mandarin Orange. It is a small evergreen tree that grows in a single erect form with single short trunks or low branched multi-trunks. It has a dense crown and for the most part the branches remain spineless, though on some varieties they do bare large thorns. They are classified in to Citrus genus, and the Rutaceae family. The leaves occur in an alternate unifoliate, lanceolate or elliptic fashion. The margins are blunt with rounded teeth and a lustrous dark green upper surface. The flowers are white, developing in the Spring with 5 petals that are produced in terminal clusters. The Tangerines is native to China and has been highly cultivated in Florida but has not yet naturalized. Many varieties and hybrid are currently cultivated and marketed in the United States. Most of the tangerines sold in your local grocery store or farmers market are hybrid varieties and have been better developed over time for greater performance and crop production. The citrus fruit is a vertically compressed hesperidium that is 5 - 10 cm in diameter, orange in color and a very close relative or member of the Mandarin family. They are much smaller in size then the common Orange and have a sweeter flavor. The rind is generally thin and loose, removing easily to reveal 8-15 easily separated sections. The fruit matures in late Fall to early Winter. The fruit is most commonly peeled and eaten right from your hand. It is also used as a garnish in salads, main courses, and desserts. The juice of the Tangerines is sold in both the raw form and concentrated in the United States. The rind can be used as a zest, flavoring or garnish either fresh or dried. Tangerines are a good source of vitamin C, beta-carotene and folate. They also contain small amounts of magnesium, Vitamin B (B1, B2 & B3), Lutein, Potassium and Zeaxanthin. The "Striped Maple" - Acer pensylvanicum, (also called Snakebark Maple, Goosefoot, Whistlewood and Moosewood) is the only Snakebark Maple that grows naturally outside of Eastern Asia. It is a small to medium deciduous tree, reaching an average of only 15-25 feet at full maturity. Mainly found growing in shrubby form in the forest understory it is usually not found in residential/commercial landscapes. It is native to moist rocky forest areas along the Appalachian Mountains, North Eastern United States and Eastern Canada. The leaves are bright green in color during the growing season and triple lobed. In the Fall the leaves change to a pale yellow and tend to fall earlier then other decidous trees in the same area. The bark is green with white stripes when young, the green darkens to a reddish brown when mature. The small yellow-green flowers bloom in pendulous form, appearing on 6 inch long racemes, each flower within the group is usually only about 1/3 of an inch. These flowers appear in the Spring (usually May depending on the area). There is a relatively low maintenance tree recommended for zones 3-7. There are no serious insect or disease problems that effect only this variety. It prefers shady areas (forest understory), can tolerate heavy shade and if planted in full sun locations may show signs of scortch on the leaves. Potential diseases include verticillium wilt, leaf spots, tar spot, canker and root rot. Potential insects include aphids, scale, borers, mites and caterpillars. The various names given to this tree are many and each has it's own "story" behind it. Striped or Snakebark Maple from it's unusual and appealing bark, which is greenish in color when young and marked with white striped (generally vertically). Stripes may vanish over time as the older bark turns reddish brown and the white begins to darken or fade. Goosefoot Maple - the broad leaves that are triple lobed and often compared to a goose foot in shape. Moosewood - Moose and white tailed deer often browse the leaves and young twigs hence the name Moosewood. Whistlewood - Whistles can easily be carved from branch sections, hence the common name of whistlewood. The Northern Spicebush (Lindera benzoin), is most easily recognized by the spicy aromatic leaves that increase in size from the base to the tip of the twig. It is a small deciduous shrub or small tree to reaches only 16 feet tall. It grows in erect form with a single trunk and open crown. When bruised or damaged the plant is quite aromatic. The leaves are alternate, simple, thin, aromatic (when crushed), with hairy upper surfaces and a dark green color. The flowers are yellow, tiny and borne in several-flowered clusters with the male and female flowers occurring on separate plants in the Spring prior to leaf expansion. The fruit is an ellipsoid, bright red drupe, 8-10 mm long and maturing in the Fall. The bark is gray, becoming darker with age. It is native to the United States from Ontario and Southern Maine to Florida in the East and Michigan and Texas in the West. It is found primarily along stream banks, moist woodlands, wetland margins from 0-1200 m.
The American Basswood - Tilia americana, is most easily recognized by the combination of alternate, two ranked, and heart shaped leaves that are asymmetric at the base and the leafy bract subtending the flowers and fruit. It is a deciduous tree that reaches heights of 60-100 feet tall that grows in an erect form with a single trunk. 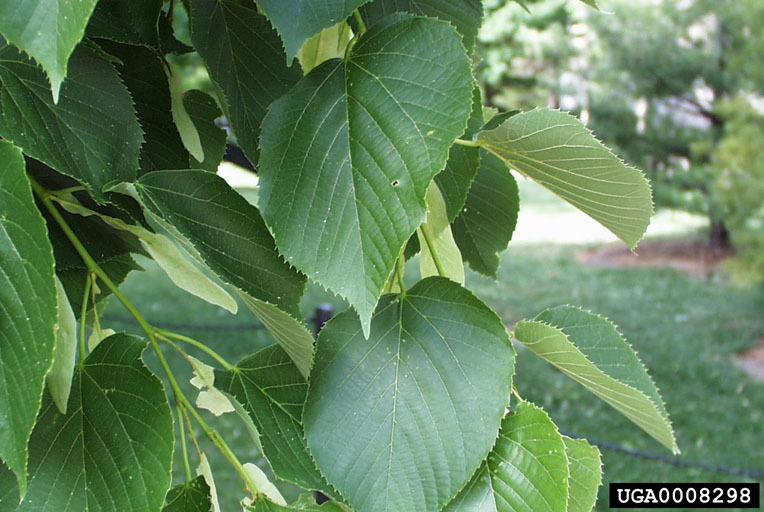 The crown of the American Basswood is ovoid or rounded with numerous slender branches. The bark of the American Basswood is smooth and dark gray when young, becoming furrowed with vertical ridges. The leaves are alternate, simple, 2 ranked, ovate, heart shaped and ovate at the base. The upper surface of the leaves are a dark yellowish green, hairless with conspicuous veins, while the lower leaf surface is a paler green color and lightly haired. The blades of the leaves are 12-15 cm long and 7-10 cm wide. The flowers are yellowish white with 5 sepals, 5 petals and inflorescence. The fruit is a rounded thick-shelled gray nut that is about 6 mm broad, maturing in Autumn. 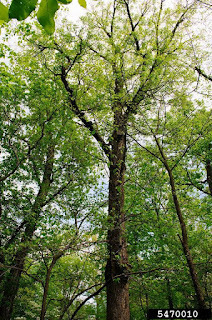 The American Basswood is native to the rich and deciduous woods of North America, it is widespread in the East from New Brunswick and Saskatchewan in the North to Central Florida and Texas in the South. In the family Solanaceae (Nightshade Family) there is a genus called Solanum it contains 1500-2000 varieties of herbs, shrubs and trees. Of these varieties two are major food crops in North America, Potato and Tomato and another less Popular including Eggplant. In other regions there are varieties such as the Ethiopian eggplant, Gilo (S. aethiopicum), Naranjilla or Lulo (S. quitoense), Turkey Berry (S. torvum), Pepino (S. muricatum), Tamarillo and Bush Tomatoes (which includes several Australian species). Most of the members of this family are native to the American Tropics, 65 occur in North America (only 35 are native). Even though two of our largest food crops are included in this genus most of the green parts of the plants and unripened fruits are poisonous, but some bear edible parts in the form of fruit, leaves or tubers. Also included in this genus are Nightshades, Horse Nettles and many other plants cultivated for their ornamental flowers and fruits. The species grows in various habits including annual, perennial, vine, subshrub, shrub and even small trees. Image Citation: Leslie J. Mehrhoff, University of Connecticut, Bugwood.org - Subject: Bittersweet nightshade (Solanum dulcamara) L.
Most of the plants have green simply shape leaves that are ovate or elliptic. Flowers can range in color depending on the variety but generally have 5 petals. The fruits can vary from small and insignificant to large and very visable - berries, tomatoes, potatoes, and eggplants. Some produce fruit from the leaves while other grow underground (like the potato). Many plants in the Solanum genus are an important food source for the larvae of some Lepidoptera species (Butterflies and Moths), these include various Angle shades (Phlogophora meticulosa), various members of the Bedellia species, the Cabbage Moth (Mamestra brassicae), Common swift (Korscheltellus lupulina), Garden dart (Euxoa nigricans), Ghost moth (Hepialus humuli), Tobacco hornworm (Manduca sexta), Tomato hornworm (Manduca quinquemaculata), and Turnip moth (Agrotis segetum) to name a few. Food Crop production in the Solanum genus is extremely important throughout the world. In 2013, the recorded world production of Tomatoes was 163.4 million tonnes, with China producing 31% of the total, followed by India, the United States and Turkey. In 2012, Tomato production was estimated to be valued at 59 billion dollars, making it the eighth most valuable agricultural product worldwide. In 2013, the recorded world production of Potatoes was 368 million tonnes. Two thirds of the global production is eaten by humans, the remaining third is consumed by animals or used in starch production. Potatoes remains an essential crop in Europe, where per capita production remains the highest in the world. The most rapid expansion over the past few decades has occurred in southern and eastern Asia. As of 2007, China led the world potato production, and nearly a third of the world's potatoes were harvested between China and India. It is believed that the geographic shift in potato production has been moved from wealthier countries toward low income areas of the world because it is a cheap and plentiful crop that is able to grow in wide varieties of climates and locales. Only about 5% of the world's Potato crop are traded internationally because of the perishability. In 2013, the recorded world production of Eggplants was 49.4 million tonnes, 57% of which came from China, 27% from India, Iran, Egypt and Turkey were also major producers all total account for 97% of the world production. More than 4,000,000 acres are devoted to the cultivation of eggplants in the world. Image Citation: John Cardina, The Ohio State University, Bugwood.org - Subject: Bittersweet nightshade (Solanum dulcamara) L.
Image Citation: Keith Weller, USDA Agricultural Research Service, Bugwood.org - Subject: Potato (Solanum tuberosum) L.
Image Citation: Peggy Greb, USDA Agricultural Research Service, Bugwood.org - Subject: Potato (Solanum tuberosum) L.
Many members of the Solanaceae:Nightshade family members can be grown in your own landscape some in your vegetable garden and others in you flower gardens. With 1500-2000 varieties and counting I am sure you can find one that is right for you! Hardiness zones vary by plant and within the family can range from zones 4-12. The Ginkgo Tree - Ginkgo Biloba - is the survivor of all arboreal survivors. There were Ginkgo trees when dinosaurs walked the Earth. The sole remnant of a group of plants even more primitive than Conifers. It is a living fossil, and fossils relating to the modern Ginkgos dating back 270 million years. They were wiped out completely in North America by the Glaciers,and thought to at one time be extinct in the wild the world over. They however thrived in China where the Buddhist monks tended to them in their gardens. When growing in the wild , they are found infrequently in deciduous forests and valleys with fine silty soil. It has long been cultivated in China and is now common in the southern third of that country. They were exported to England in 1754 and to the U.S. about 30 years later, cultivated in both countries for over 200 years it has failed to become significantly naturalized in either. Ginkgos are also known as Maiden Hair trees, and sometimes referred to by a variation in spelling on the name -Gingko/Gingo/Ginko. They grow to be very tall, they average between 60-100ft, with some specimens in China reaching over 160 ft tall. The tree has an angular crown and long, somewhat erratic branches. This tree is deep rooted which makes it tolerant to wind and snow damage. They grow best in moist soil, but are known to be very tolerant. Young specimens are often tall, slender, and sparcely branched, but with age the crown broadens. In the fall the leaves will turn a bright yellow before they fall often within as short a span as 15 days. Their combination of disease resistance, insect resistant wood, and their ability to form aerial roots/sprouts make them very longed lived. Some specimens in China are claimed to be over 2500 years old. Being Dioecious, Ginkgos are either male or female. Males produce small pollen cones. Females do not produce cones, instead two ovules are formed at the end of a stalk and after pollenation one or both develop into seeds. The seed is 1-2 cm long, the outer layer is a yellowy brown flesh that is soft and fruit-like. It is attractive in appearance but contains butanoic acid (or butyric acid). The males are generally preferred in urban landscapes because the fruits from the females tend to be messy when they fall onto sidewalks and have a peculiar odor from the butanoic acid (often compared to a strong cheese). The kernel/seed (or Silver Nut) inside the fruit is considered a delicacy in the Orient. The fertilization of a Ginkgo occurs via motile sperm (as in Cycads, ferns, or moss), the sperm have a very complex structure. They adapt well in urban enviroments, tolerating pollution as well as confined soil space, for this reason as well as just being a beautiful tree they are often planted in streetside setting. Used in both culinary and medicinal settings, the Ginkgo is thought by some to have health benefits and is also considered by others to be an aphrodisiac. However when eaten in large quantities for a number of years (especially by children) the meat of the seed can cause poisoning. Others are sensitive to the chemical in the outer fleshy part of the fruit, having symptoms similar to poison ivy. The extract of Ginkgo leaves contains flavonoid glycosides and terpenoids and have been used pharmaceutically. Medical trials have shown Ginkgo to be moderately effective in improving symptons in dementia patients, but not in preventing the onset of Alzhemiers disease in the average person. Used primarily as a memory and concentration enhancer, and anti-vertigo agent, even though some studies differ in results about its effectiveness. Ginkgos are truely an amazing species of tree all on their own, surviving and adapting for hundred of millions of years. The Sourwood Tree - Oxydendrum arboreum is very unique as it is the only species in it's genus. This genus is a part of the larger Ericaceae Family, which is commonly called the Heath or Heather Family. The Ericaceae family is made up of a very diverse group of plants including Heather, Azaleas, Rhododendron and Madrones. The Sourwood has grey bark with deep lobes that almost make the bark appear chunky. The leaves are very finely toothed and a smooth grey-green in color during the growth season and a bright red, crimson or even purple in the fall. The leaves are arranged alternately and average 3-8 inches long. The flowers are white or ivory in color and bell shaped, they are very small only 1/4 to 1/3 of an inch each. The flowers though small on their own grow on 6-10 inch long panicles. The fruit are small downy, five sided/angled woody capsules that are ivory in color. The roots of the Sourwood are considered shallow, this tree grows best with little to no root competition. It prefers very acidic soil and will not tolerate . The wood of the Sourwood is heavy, hard and close grained. This type wood takes well to high gloss finish. 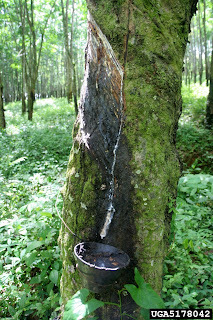 Honey produced from the flowers of this tree is considered by many to be unmatched by clover, orange blossom, or any other honey. It is native to Eastern United States, ranging in the North from Pennsylvania and in the South from Western Louisiana, Mississippi, Alabama, and Northwest Florida. It is found most commonly in the lower chain of the Appalachian Mountain. Recommended for hardiness zones 5-9, this tree is a medium sized deciduous tree that makes for a lovely ornamental addition to any landscape. With a maximum height of 35-70 feet and a spread of 20 feet it's size allows it to fit in places where some other shade trees will not. The Scarlet Oak - Quercus coccinea is most easily identified by it's deeply cut leaves in combination with 1 or more pitted rings at the acorn apex. It is a fast growing deciduous tree that can reach heights of 100 feet tall. Generally growing in an upright fashion with a single erect trunk that is more often then not swollen at the base. It is native to the Eastern and Mid Atlantic regions of the United States from Maine in the North to Georgia, Mississippi and Alabama in the South, spreading as far West as Wisconsin. It is closely related to the Northern Pin Oak - Quercus ellipsoidalis, Shumard Oak - Quercus shumardii, Northern Red Oak -Quercus rubra and Pin Oak - Quercus palustris. The crown of the Scarlet Oak is rounded and open with spreading branches. This Oak has alternate, simply shaped leaves with 5-7 lobes each that range in size from 4-7 inches long. Leaves are bright green in the Spring and Summer and change to a brilliant Scarlet - Red in the Fall. The upper surfaces of the leaves are lustrous and hairless, while the lower is paler with tufts of hair in many of the vein axils. The fruit is a bowl shaped cupped acorn that is 7-15 mm deep enclosing 1/3 - 1/2 of the brown nut. Acorn crops are produced annually, however large crops are only seen every 3-5 years.The bark is thin, brown to dark gray in color, finely ridged and furrowed in texture. The Scarlet Oak is often planted for a combination of it's rapid growth, beautiful foliage, soil tolerance, wind resistance and upright habit. It makes for a lovely focal point in any landscape. Scarlet Oak prefers well drained slopes, dry uplands, ridges, and even does well in poor soils (except akaline). Full sun is recommended for best performance (6 hours of direct sunlight daily). The best performance for the Scarlet Oak naturally seems to be in the Ohio River Valley where specimens are many in number, long lived and lovely in shape. It also is a very successful part of the South Appalachian forest story. Scarlet Oak is recommended for hardiness zones 4-9 and can be found at most larger nurseries. It is widely used in park settings, along roadside and in residential and commercial landscape design. The Scarlet Oak is the official tree for The District of Columbia. Scarlet Oak acorns are an important food source various types of wildlife including, songbirds, wild turkeys, grouse, squirrels and white-tailed deer. The Leitneriaceae Family currently only contains one single species, the Corkwood Leiterneria floridana. The Corkwood is a very sporadically distributed species found only in Northern Florida, Southeastern Texas, Eastern Arkansas and the far Southeastern region of Missouri. It is most commonly found growing in swamp areas, depressions, ponds, roadside ditches or bordering tidal marshes. It is easily recognized in it's native regions by it's very upright form combined with elliptical leaves, catkins, and tan colored lenticels found within the red-brown bark. The Leitneriaceae florida is included on The IUCN Red List of Threatened Species as a "Near Threatened/Lower Risk" species because of its very small number (limited by a very small native range), thought they do not show a significant decline in the population. Leiterneria floridana was only first discovered in 1835, in the saline marshes of Florida where the Apalachicola River empties into the Gulf of Mexico. The Corkwood is a small deciduous tree or shrub that only averages 15 feet in height at maturity. Corkwoods always grow in a very upright form and generally have one single straight trunk with a narrow crown containing very few branches. The leaves appear in alternately in simple narrow elliptical form. The upper portions of each leaf is lustrous, leathery and medium green in color, while the lower surface is a more dull pale green. The leaves have fine hairs on the surface when young, becoming hairless when mature. The foliage is among the most persistent of the deciduous autumn leaves, remaining green till late November (in the more northern portions of it's range), then becoming greenish-yellow. The flowers are unisex with male and female flowers on separate plants. The male flowers appear in upright grey-brown catkins that are 2-5 cm long, while the female appear in reddish catkins that are 1-2 cm long. The fruit occurs in a single seeded ellipsoid drupe that is yellow-brown in color. The wood of the Corkwood is very fitting to it's name as it is extremely lightweight. The wood is often compared to balsa wood and can be used in similar applications. Corkwood is the lightest weight of all of the native Eastern North American trees. Portions of the trunk/stems have even been used to craft fishing floats. The Corkwood - Leiterneria floridana is not the same as the shrub also commonly known as Corkwood - Stillingia aquatica (of the Euphorbiaceae family). The genus, Corkwood Leiterneria floridana is thought by many researchers to be related to the similarly pollenated quassia family (Simaroubaceae), though they retain very unique and identifiable features that easily separate the two. In Italy a single compressed endocarp was collected from the Villa San Faustino site in Italy. This single specimen shows that until the Early Pleistoncene period Leitneria venosa grew there. Leitnera is also listed as a species found within the early Pliocene San Gimiginiano flora. Several other similar endocarps have been found on other sites in Northern Italy dating all the way up to the Cenozoic period, though rare. These fossils shows that the Leiterneria family was not always made up of this one single species but had other members with possibly a greater range then the Leiterneria floridana. American Plum - Prunus americana is best recognized by the combination of flaking scaly bark, sharply toothed leaf margins and red or yellow fruit. It is a deciduous shrub or small tree that is capable of reaching heights of around 25 feet. Generally it grows in an erect form with a single trunk, the young shoots are often thorn tipped. The American Plum is native throughout the Eastern United States and continuing West through the Rocky Mountain region. It prefers rich, moist, loamy soils, open woods, woodland margins, fence line and stream banks. American Plum is sometimes considered to be thicket forming in woodland areas, though it is believed these thickets are formed by seedlings rather than root suckers. American Plum can be found at most nurseries in the native region. Currently there are over 260 varieties that have been developed from the American Plum which greatly improve the reach of it's growth range. The Bear Oak-Quercus ilicifolia is a small deciduous tree that is most easily identified by it's love of rocky habitat and leaves with a hairy lower surface. It grows in a small tree or gangly shrub form with a densely rounded crown. It does not exceed 40 feet tall but only averages around 15-20 feet tall and generally has one or more short contorted trunks. The Bear Oak is native to the North Eastern United States and can be found from Ontario to Main in the North and West Virginia to Virginia in the South. Bear Oak can be found growing in CT, DE, ME, MD, MA, NH, NJ, NY, NC, PA, RI, VT, VA, and WV. It prefers dry soils, mountainous terrain and rocky outcroppings. 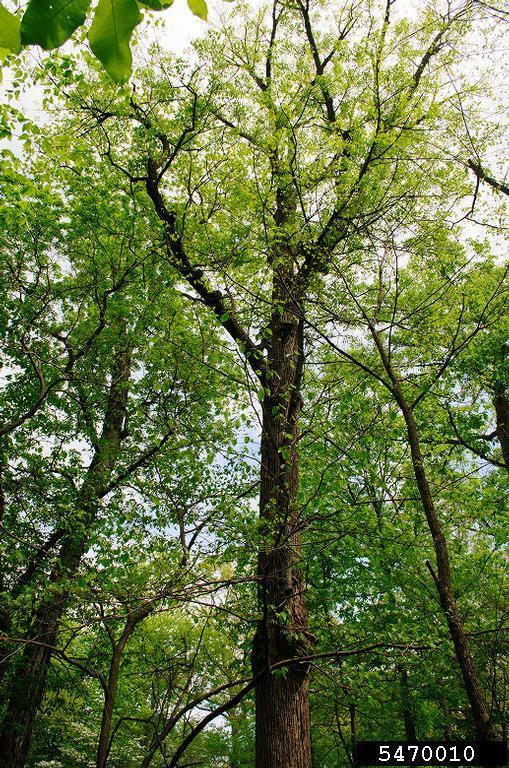 Individual above ground trunks or stems of the Bear Oak are not long living. Maturing to only about 20 years of age, they arise from one single long lived taproot that can be as thick as 20 cm in diameter and reach as deep down in the ground as 3 feet. The Bear Oak is adapt to hybridizing with various members of the Red Oak family. The Bear Oak species is considered threatened in North Carolina and is on the Endangered list in Vermont. The Common Pricklyash - Zanthoxylum americanum or the Toothache Tree as it is also called. Is best recognized by the combination of alternate pinnate leaves with paired prickles, and occasional paired prickles at the leaflet nodes and clusters of greenish yellow flowers. It is a small deciduous, thicket forming, slender tree that usually only reaches heights of 20-35 feet tall. It is native to the Northeastern, Central and Mid-Atlantic United States with occasional specimens found as far South as Florida. It prefers moist or dry woodlands and rich soils from 0-600 m, it is widespread in the East. The leaves are alternately pinnate with blades that are 15-20 cm long, petioles that are 3-6 cm long and 5-11 leaflets each. The upper leave surface is a medium to dark green that is lustrous in sheen, while the lower surface is paler and hairy. The flower of the Common Pricklyash is unisex or bisexual with the male and female generally occurring on different plants. Each flower contains 4-5 green to yellow petals with fringed tips and 2-5 pistils that are produced in small axillary clusters in the Spring-Summer season. The fruit is a fleshy brown pod with 1-2 shiny black seeds each, the fruit matures. The Hercules club is considered to be the most similar species to the Common Pricklyash, though it's prickles are more stout and irregularly scattered, they are similar in appearance and often confused for one another by the untrained eye. The Yellowwood Tree - Cladrastis kentukea, is a medium sized deciduous member of the legume family. With it's smooth elephant grey bark, pendulous fragrant flowers, and red/brown stems it offers beauty to any landscape year round. It is native to the Eastern United States, most notably two very small areas, one runs along the Kentucky and Tennessee border, and the other between Missouri, Arkansas and Oklahoma. It is commonly planted in landscapes from New England south to Washington DC & Virginia. Yellowwood is hardy from zones 4a to 8b and can be purchased from most large nurseries in the Eastern US. The leaves are composed of widely spaced leaflets that are alternate not opposite one another. There are usually 9-11 leaflets per leaf. The leaves are a yellow green in Spring, bright green by Summer and then Yellow in the Fall. The wood of this tree contains a Yellow dye which stains the heartwood, hence the name Yellowwood. The flowers of the Yellowwood are very similar to Wisteria, they grow in a pendulous form and feature white fragrant flowers. The flowers are small and grow on open panicles ranging from 10-15 inches long. They are considered to be highly fragrant and appear in May. The flowers give way to long brown seed pods as the Spring Summer season changes. When mature this tree can reach heights of 30-50 feet and a spread of 40-55 feet wide. It is considered to be virtually pest free and quite hardy in it's native range. This tree is easily transplanted in B&B or bareroot up to 2 inches in caliper. The Society of Municipal Arborist named this tree the "2015 Urban Tree Of The Year", this selection was made based on it's adaptability and strong ornamental traits. The "Sweetbay Magnolia" - Magnolia virginiana - is native to the Eastern/Atlantic and Gulf Coast regions of the United States, with it's highest "natural" numbers occurring in the South Eastern States of Alabama, Florida, Georgia and South Carolina. It grows naturally most commonly in poorly drained or highly acidic soils that are often subject to flooding. This tree has a vase shaped growth habit and generally reaches 10-20 feet tall at maturity. It is considered a medium to fast grower, gaining an average of 12-24 inches per year when young. The Sweetbay Magnolia is hardy in USDA zones 5-9. Some cultivars found at local nurseries may include the Southern (australis), Henry Hicks, and Moonglow. Many animals and insects make use of the Paw Paw tree and it's fruit. The flowers attract blowflies, carrion beetles, fruit flies, carrion flies and other beetle varieties. The fruits of the Paw Paw are enjoyed by a variety of mammals, including raccoons, foxes, opossums, squirrels, and black bears. Larvae of the Zebra Swallowtail Butterfly, feed exclusively on young leaves of Paw Paw. Chemicals in the Paw Paw leaves offer protection from predation throughout the butterfly's life remaining in their systems and making them unpalatable to predators. Whitetail deer do not feed on the Paw Paw.